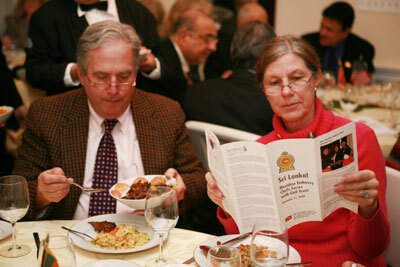 who participated at “The Embassy Chefs Series with Gail Scott”. 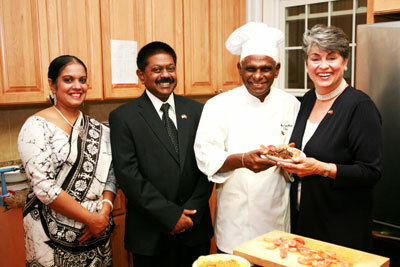 The Meridien ‘Embassy Chefs with Gail Scott’ was hosted by Ambassador Jaliya Wickramasuriya and Mrs. Wickramasuriya at their historic Embassy Row Residence, on Thursday, December 11, 2008. The main feature of the event was the presence of the island’s most celebrated Chef – Dr. T. Publis Silva of Mount Lavinia Hotel to conduct culinary demonstrations. Master Chef Publis Silva conducts culinary demonstrations to large number of Americans. 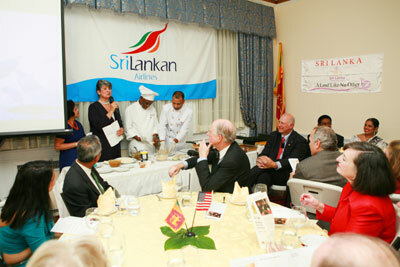 The event was widely acclaimed by the all-American gathering from the Greater Washington DC area, including representatives from the US Department of State and Department of Justice, who were treated to exotic gastronomical treats, refreshing beverages and soothing ambience tunes, complemented by the renowned Sri Lankan hospitality. The guests were treated to traditional Sri Lankan drinks upon arrival, following which they attended the demonstration and a sumptuous Sri Lankan dinner. While rice based ‘Komm Pittu’, Eggplant Pickle or ‘Moju’, Fish Cutlets, and Watalappan – a Sri Lankan dessert were demonstrated and variety of other exotic food items were served for dinner. 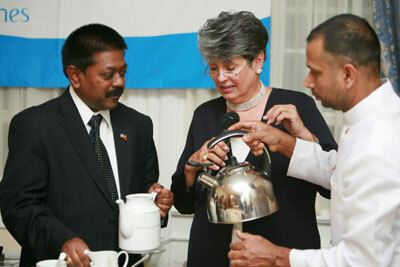 In conclusion of the event, Ambassador Wickramasuriya demonstrated the correct way of brewing a perfect cup of ‘Ceylon Tea’, of which samples were gifted to all the guests together with Sri Lankan recipes as well as several other gifts in the Sri Lankan gift bag presented to each guest. 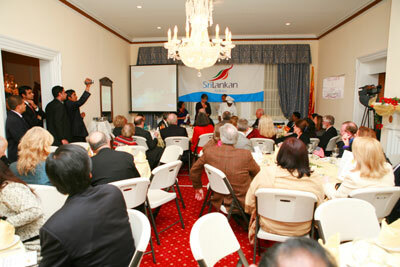 At the end of the event, attendees signed up to receive information on a tour to Sri Lanka to be arranged by the Embassy in 2009. In his opening remarks following a short video presentation on Sri Lanka, Ambassador Wickramasuriya, thanked Chef Publis for taking time off his busy schedule to visit the United States and attending this grand event, as well as Sri Lankan Airlines and Sri Lanka Tourism for sponsoring the event, and invited all the guests to visit Sri Lanka, to experience the wonders of the Resplendent Island. Ambassador H.M.G.S. Palihakkara – the Sri Lankan Permanent Representative to the UN, and Dillan Ariyawansa – Vice President, Sri Lankan Airlines (North America) and Sri Lanka Tourism representative in New York were also present at the event. The Embassy Chefs Series with Gail Scott organized by Meridien, in close collaboration with diplomatic missions based in Washington DC, is a program primarily focused on culinary arts of different cultures and countries. Meridien International Center (MIC) is a Washington based forum, which promotes awareness and understanding of foreign cultures with the objective of fostering closer relations between the people of the United States and the rest of the world. Click here for the event page on the Meridien website. Click here for Chef Publis Silva’s bio.